« Looks Like Rain For A Few Days! Lots of rain over the last several days AND we are in for more. According to our local predictions, we will see thunderstorms developing late in the day on Friday and continue into Saturday where the predictions is for 100% chance of heavy thunderstorms…..probably all day and into the night. Sunday had backed off a little with showers predicted in the morning and cloudy in the afternoon into evening. Monday I see sunshine! After that, chances for rain decrease so maybe we can dry out. Needless to say, with all this rain, Taneycomo is running three generators (one is down for maintenance) and have five of the flood gates open at one foot. Last time I checked, they were running a bit over 15000 cfs. We will probably see lots of water for a while, especially with the rain coming in this weekend. Before flood gates, Gina had Jim out last Wednesday. 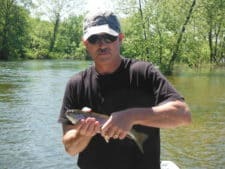 They started out fishing good, but around 11:00 a.m. they turned on two generators, and the fish decided to get lockjaw. Before generation, it was a tan filoplume or ruby 2 midge. A few hits on a crackleback and wooly bugger after generators. Mike from Iowa was out with Stan for a half day. They had a pretty good day on the ruby 2 and the holographic green crackleback. Stan’s biggest grunch was the wind!! Thursday was almost a repeat of Wednesday. Two units came on at noon and the fish got lock jaw. Stan had Colby and Cory on the water and they landed a few fish on the black copperhead midge. Last Sunday morning it was baptism by fire. First thing that morning, they started releasing more water. When we got to the river, it was probably around 10,000 cfs. Before the day was over, we had 12,000 cfs going. No great expectations, but it really turned out better than we expected for the first day of high water. Dana and James Albert had a group of guys from Minnesota on the river for a couple days. Bill went with Dana and their first day produced fish on the crackleback, big ruby and the JQ streamer. James Albert had two new to fly fishing guys, Bud and Gary. Gary caught his first fish on a fly rod using the big ruby with a ruby 2 dropper. Jim and Stan had a group from Kentucky. Buddy and Pam spent the day with Jim. Good day for them on the tiger tail, ruby and the hot hare’s ear midge. Stan’s couple, Mike and Brenda were catching on the ruby 2 midge. from Kansas, out all day. We had a great day on the big ruby under the cerise worm, and stripping the holographic green crackleback behind a tiger tail on a 4 ips sinking leader. Dana and James Albert’s guys hit the water again on Monday. Another good day for Dana’s guys on the crackleback, bug ruby and a size 14 miracle scud. James Albert’s guys were catching on the big ruby with a little ruby dropper or the beadhead red San Juan worm. 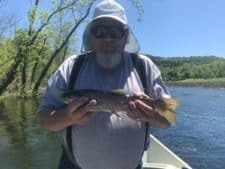 This entry was posted on Thursday, April 27th, 2017 at 2:13 pm	and is filed under Fishing Reports. You can follow any responses to this entry through the RSS 2.0 feed. You can leave a response, or trackback from your own site.